For I have created a bacon jam recipe that's autoimmune protocol compliant. I repeat: BACON JAM that is AIP COMPLIANT. And it's fab on burgers. 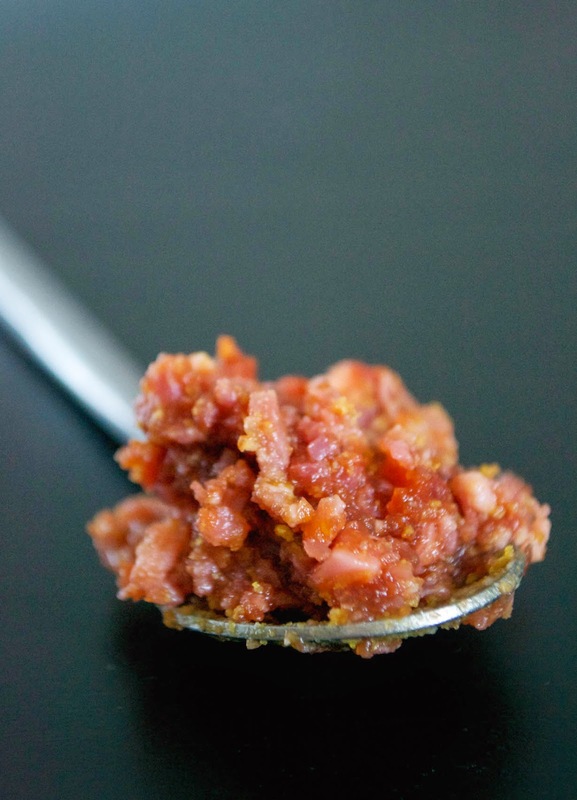 I remember my first taste of bacon jam, waaaay before I started the autoimmune protocol. It was sweet, salty, smoky and sticky. I ate it in sandwiches, salads, straight from the pot standing in front of the open fridge... and to be honest, I missed it. It's gorgeous. Smoky, sweet, a kick from the vanilla. I wouldn't go overboard with it though. Use a small spoonful as a condiment - a topping for a burger, a spoonful alongside some pale, sweet scallops or in a prawn salad. You could also stir it into stews for a sweeter bacon flavour instead of adding the bacon itself. The recipe here makes quite a bit - enough to fill a large cereal bowl - and I think you could even freeze half of it to bring out later if you wanted to. The only bit of prep is that you need some nightshade free tomato sauce to stir in - when you've made a batch, keep back a few tablespoons and make this. You're going to love it. Finely chop up your bacon and gently fry, to release the fats, in a medium to large-sized saucepan, stirring regularly. 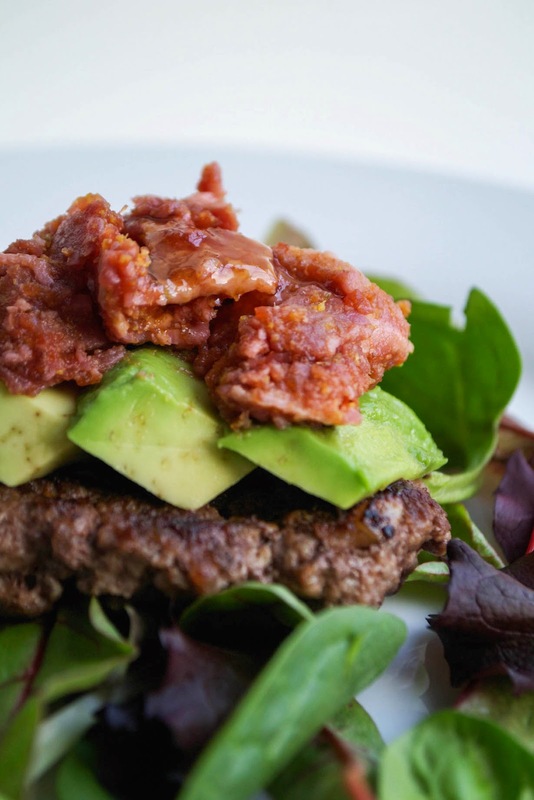 If your bacon isn't very fatty, you can add a little coconut oil or duck fat to help it along, but not too much. Once most of the fat has rendered down from the bacon add the chopped onion and garlic cloves. Stir-fry for a couple of minutes until the onion has started to soften and the bacon is golden. Add the maple syrup, cider vinegar, beef broth and vanilla extract and stir, bringing to a gentle simmer. Cook on a low heat for another 20 minutes or so, until most of the liquid has evaporated but you still have a small amount in the bottom of the pan. Stir in the nightshade free tomato sauce until it's warmed through and then turn off the heat and allow to cool. If you want it more thinner and jammier, you can chop the bacon up a bit more in a processor, but I like it quite chunky. Once cool, store in an airtight container in the fridge. Use within a week.